To create an environment of healing and relaxation is his intention. He is perfectly supported by Russ Gold (drums) and G Koop (acoustic and electric guitars) approaching this goal. 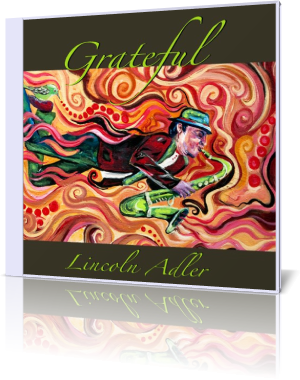 To create an intimate atmosphere, in which Lincoln's sensitive sax can blossom, his fellow-musicians stretches out for a peaceful instrumentation. That way Grateful grows with great sensitivity. When tones dribble like raindrops and Lincoln raises his sax with sensibility, then you have the time to listen to your soul and Beautiful is your guidance. Lincoln has a distinctive inner balance to present tunes correspondent At Peace with credibility. Songs like Vistas Of Freedom with an average length of more than 7 minutes take your time, but this investment pays. The dynamic groove of Signs Of Life draws you into the inner circle of leisure. Enough substance to distinguish the sound from new age, Adler delivers an adequate amount of entertainment to keep you in tension. Dancing At Twilight is dominated by a marching snare in the style of Ravel's Bolero underlined by a swaying bass. A rhythmic platform for Lincoln's soothing sax. Island Dreams introduces a reggae-flavored theme into the musical bolster. With The Healer Lincoln rewards the attentive listener with another appealing piece. Lullabye For The Restless provides the final hook to keep your interest for Grateful on a glooming level. Let's recapitulate Lincoln's intention to deliver a fresh helping of instrumental down-tempo melodic tracks. Keeping this in mind Grateful is definitely a musical remedy in these stressful times.